A 50-year-old photographer and university lecturer says that he has been taking photographs of real-life fairies for the last two years. He said that in the beginning he did not know what he was capturing in his photos and when he blew them up he got a shock. He said that following this he went back and took more photos of the gnats and flies but they did not look the same. Of course, people might want to cast their minds back to 1920 when Frances Griffiths and Elsie Wright said that they had captured photos of fairies playing at the bottom of the garden. It wasn’t until the 70s that the photos were debunked and revealed that the photos included cardboard cut-outs. 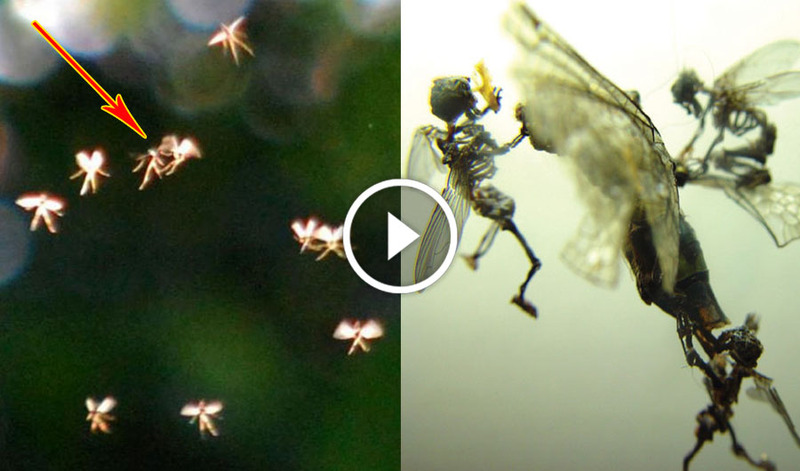 So is this another hoax or are the fairies in the recent photographs nothing more than flying insects? John Hyatt is going to be displaying the fairy photos in the Rossendale Whitaker Museum and he said that there are stranger things in life than fairies. Looking at the photographs blown up it does seem that there are wings on either side of what looks like a body, with arms and legs dangling down underneath. Hyatt said that people should look at the photographs with an open mind and then decide for themselves just what the creatures are in the photographs. He went on to say that it was one of the situations where people had to see something to believe. He concluded by saying that many people had seen them and said that the photographs had brought magic into their hearts. This is not the first time in recent years that someone has said they have captured a photograph of a real life fairy. In 2015 Lisa Wildgoose was out taking photographs in the forest and she stopped to take a close up of some bluebells. It was only when she got home and uploaded the photographs taken that day to the computer that she found a mysterious figure that was hovering near to the bluebells. favorite from Peter Pan. She said that when she saw the photograph she had been shocked and she showed it to her girls, who also said that it, was a fairy. In 2009 Phyllis Bacon from South London claimed she had taken a photograph of a real-life fairy at the bottom of her garden. She said that the fairies had been enjoying themselves flying around the garden and the pictures she had taken were beautiful and were enough to make people believe in fairies again. The Cottingley fairy photographs were one of the most elaborate hoaxes involving fairies in Yorkshire in the United Kingdom. Elsie Wright, aged 16, said that she took photographs of her cousin playing at the bottom of the garden with fairies. Wright along with Francis Griffiths had got into trouble previously when she fell into a stream at the bottom of the garden and said that it happened when she was playing with fairies. Shortly after getting into trouble they devised a plan that would go on to make headlines and which would take many years to prove it was a hoax. Elsie said they should take photographs of fairies to prove to her mother they were telling the truth and so they drew fairies, cut them out and pasted them onto cardboard. Little did the two realize that they would create photographs that would be some of the most reproduced in history? The girls arranged four fairies on bushes and Frances was staring at them and the photos were taken. Her father exposed the photographs in a dark room and the children said that they were proof fairies were real. The photos spread fast and the pair stuck to their story for many years, until Frances reached the age of 76 and confessed. A joke that should have lasted just hours lasted 70 years. Fairies are usually described as beautiful, enchanting women. They are female spirits who can appear and disappear at will. They can make themselves invisible when they want and only show themselves to those they want to show themselves to. Fairies can give people certain abilities. They are particularly close to nature. Their empire is meadows, forests, mountains, and water. Fairies, when offended, can cause diseases that no normal doctor can cure. But the fairies only do this when humans treat them disrespectfully. But they’re never really vicious. In general, fairies are good-natured and helpful. They reward people for good behavior with gifts and fulfill wishes. Fairies are spirits from Roman and Celtic mythology. They have magical powers and can be female or male. They often appear in threes, or sometimes in sevens or twelfths. Its name originally comes from “Fata”, the Roman goddesses of fate. In the medieval poetry of the German-speaking world they are called “Feien” or “Feinen”. Fairies are available in different designs, but mostly with wings on the back. They can look like humans, but can also appear as animals, dragonflies or butterflies. They adapt to the being with whom they want to connect. Thus there are giant and mini ribbons. Some fairies wear noble evening dress, some appear ragged or even completely naked. Since their favorite colors are red, green and white, they have enchanted them so much that most people don’t like them. They don’t like it when people wear their favorite colors. There are fairies who live in large groups with a fairy queen or a fairy king and there are also loners. The home of the fairies is mostly in nature and well hidden. They can be caves, trees or stone circles, but this is only the entrance to their world. Fairies exist in good and also in bad execution, thus they can bring both joy and suffering, even if rather rarely, to humans.